the Armed Forces Service medal (which is for service after 1992). 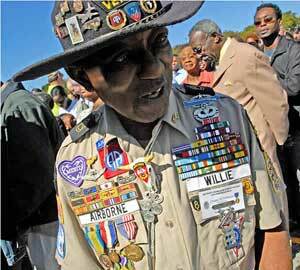 He's also wearing a Navy Combat Action ribbon, which he only could've earned as a member of the Navy or Marines. He also has an Overseas Service Ribbon which can only be awarded to people on active duty after 1981. His National Defense Service Medal has an oakleaf cluster, subsequent awards of the NDSM are denoted by a bronze star device not an oakleaf. This page contains a single entry by DaveH published on October 27, 2008 8:56 PM. A collection of photographs was the previous entry in this blog. Offline for a day or two is the next entry in this blog.